"Josh is our guy," Kliff Kingsbury said. The speculation has run rampant, especially over the last 24 hours. On Monday, Oklahoma quarterback and 2018 Heisman Trophy winner Kyler Murray announced he has chosen football over baseball and will enter the 2019 NFL Draft. This announcement fueled already existing rumors that new Arizona Cardinals head coach Kliff Kingsbury would be inclined to trade quarterback and 2018 first-round NFL Draft pick Josh Rosen, and draft Murray with the Cards' No. 1 overall pick in April. 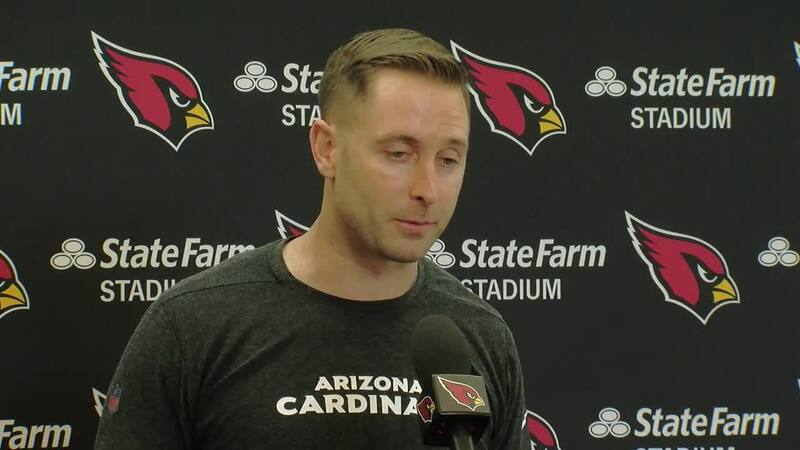 But at the Cardinals' practice facility on Tuesday, Kingsbury did his best to extinguish those rumors by reaffirming his support for the Cardinals' current No. 1 quarterback. "Our feelings toward Josh (Rosen) haven’t waned or changed or anything," Kingsbury said. "I get that we have the first pick and so there are going to be a million scenarios over the next three months that are going to come up. But Josh is our guy." Rumors of Kingsbury's interest in Murray were driven largely by a comment Kingsbury made in October days before the team he used to coach, Texas Tech, were set to face Murray and the Oklahoma Sooners. Oklahoma QB Kyler Murray chose Erik Burkhardt as his agent, per sources. Burkhardt also represents Cardinals’ HC Kliff Kingsbury, who said last fall he would take Murray if he had the No. 1 overall pick. But on Tuesday, Kingsbury made it clear he was simply following a common practice of saying nice things about the upcoming opponent. "Kyler is a tremendous player and I said that very complimentary before we played an opponent," he said. "I understand the soundbite. But like I said, there will be a ton of scenarios that will come up before we get to the draft." On Tuesday morning, Cardinals president Michael Bidwill told Arizona Sports 98.7 FM that the team stands behind Rosen, who started 13 games for the Cardinals in his rookie season. “Josh is a smart guy, he’s been around and he’s seen what happens year in and year out," Bidwill said. "There's always a lot of speculation that turns out to not be true. But moving forward, we're going to continue to build this team and build around the foundation that we have."